I am 43 years old, live in Orlando, FL, have two kids (Emma, 11 and Ryan, 9), and have been married for 17 years as of tomorrow! [August 21st] Five years ago, I quit a corporate management position to stay home with my kids. Raising a family with an 80 hour work week and travel was providing me a one-way ticket to the looney bin. I was exhausted and burned out. Luckily we were in the position that we could afford to do this, and I haven't looked back. I stay busy. I golf, I volunteer at the kids' school (I am the Book Fair Queen), and I do all the pool, house and yard work. And blogging of course! One aspect of my life that invades many topics is my husband's background. He was born and raised in communist Poland, and came to the US when he was 19. He has a very fascinating and colorful family history that is deeply intertwined with WWI, WWII and the Solidarity movement. We visit Poland every other year to see my husband's parents, sister and nephew. I hope you don't mind if I borrow one of your questions - it's just that it's a really good one! Can you tell us a little bit about how you first started blogging? A year ago, I never would have dreamed of having a blog. I love to read, and always have, and I love to write, but it never crossed my mind. My sister has been maintaining a movie review blog for the last couple of years, and I've always admired her for that. Last October, I mentioned to her in passing that I wished I could find a good online book club, but hadn't had any luck. She said (I imagine an infamous word bubble that is still floating in my house somewhere) "Well, hell, sis! Do your own book blog. What do you have to lose? I'd read it!". Oh yeah right. I told my husband, and he just shook his head. But the seed was planted, and pretty soon, that is all I could think about. I was insecure about the whole thing, but I couldn't get the idea out of my head. A week later, I published my first inane post. I very much doubt it was inane! One of the first things I noticed about you was that you're a great commenter. You always have something thoughtful and encouraging to say. So I thought I'd ask you to share some of the reasons why commenting is so important to you. Comments have always been very important to me. For awhile, I felt like I was blogging to myself. I knew my mom and sister were reading it, but they never uttered a word. But you get that first comment (on Tana French's The Likeness, I remember!) and over the moon I went. I know how good it feels to get feedback, and like to make sure I return the favor. Beyond that, I am just a chatterbox and never shut up! Agreed! About the feedback that is, not you being a chatterbox. Do you find it hard to juggle your offline life, posting on your own blog, commenting on others, and making time for other hobbies, etc.? Any time management tricks you could tell us about? What's your all-time favourite book? If picking just one is too hard, maybe you could tell us about a book you love but haven't discussed on your blog before? Don't worry! I doubt any of us could pick just one. My next question is: if someone who's thinking of starting their own book blog were to ask you for a few tips, what would you tell them? Excellent advice, Sandy. Now tell us about a great book or author you discovered thanks to blogging! My dear friend Jackie at Farm Lane Books sent me a birthday gift this year, a book called Random Acts of Heroic Love by Danny Scheinmann. This was one of Jackie's favorites from 2008. I'd never heard of this book and probably never would have, had it not been for blogging. It is an amazing, touching book that earned a serious 5 star from me. You've mention on your blog that you have family in Poland and visit there regularly. What are your favourite things about travelling? Maybe you could tell us about your favourite place that you visited, either in Poland or elsewhere? My family loves to travel. My husband and I are fortunate enough to have my parents available to watch the kids so we can get away on our own (we love golfing trips), but we also enjoy taking the kids along as well. You get so wrapped up in your day-to-day lives, that it is easy to lose touch. On vacation, though, you reconnect, you have earnest discussions, and adventures together. Traveling to Poland, specifically, is extra special because of the time we have with my in-laws. They bask in the company of their grandchildren. Poland has some beautiful country to see also. For the third time in our trips there, we spent some of our vacation in the Tatra Mountains, on the southern border by Slovakia. We rented a big house that overlooks this majestic mountain range. We grilled kielbasa over an outdoor firepit, went rafting on a river that runs through a gorge, and hiked until we couldn't walk. I'm not sure if I could come up with a destination that we have enjoyed more than that. Except maybe for Californian wine country, but that is a whole different ballgame! 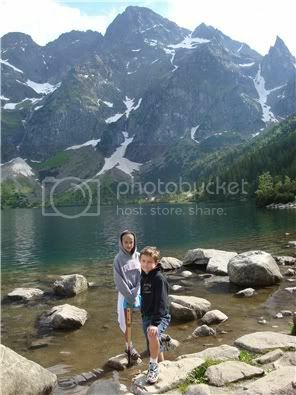 Sandy's children in Poland - how gorgeous a place is this? Thank you so much, Sandy! Chatting with you was a pleasure. You can visit Sandy's blog to read her interview with me. And also to get to know her better, of course! Great interview! I read your answers first then dashed over here to read the second part! Very insightful. I loved learning about how Sandy came into blogging and her trips to Poland. Sandy's blog is new to me and I feel that straight off I know her. Fabulous pairing! Brilliant interview! I really need some interviewing tips from you two as these are the best interviews I have seen so far today. I have Pillars of the Earth here - I'm going to try to read it soon, but it is so long! I'm pleased to see that Sandy is spreading the word about random Acts of Heroic Love - it is an amzing book and I wish more people would read it. what a great interview Ana!! It's certainly a way to get to know fellow bloggers...and everyone has a life story to unfold. I love the pics she included. Great job! Claire: One of the things that I love the most about BBAW is seeing bloggers I love getting to know each other. I'm so glad you discovered Sandy! Jackie: She definitely make me want to read Random Acts of Heroic Love :) It sounds like a beautiful book. Chris: Aren't the pictures gorgeous? I thoroughly enjoyed learning more about Sandy. I started my blog for the same reason: had wanted to be a part of a book club for years, but never found one - and blogging has fit the need. Super interview! I know the feeling, Sandy, of writing posts and wondering if even one person read it. I don't think my mother reads my blog. My sister-in-law might, but I'm not sure. Superb interview! I love this feature of BBAW; I made a new friend through the interview swap. I have Sandy's blog in my google reader and although I don't comment much I do read her blog regularly. I enjoyed her posts on Poland and also what books she has read with her kids. Random acts of heroic love is on my wishlist. Thanks Nymeth for the interview. Oh, that picture of Poland is breathtaking! I totally started getting involved in the book blog community for the same reason as Sandy. I never found a book club and I really wanted to talk about books! Finding people to do that with is the greatest gift. I've only recently added Sandy's blog to my reader but I can't wait to read more of her posts. Greta interview! Sandy has a fantastic blog and leaves the best comments so it was fun getting to know her better. Great interview. I am so jealous that Sandy lives in Florida, my dream home. You know, with a lot of interviews I don't feel like I really get to know either the interviewer or interviewee, but you did a fabulous job, Ana. I'm off to check out her blog and I already feel like I know her just a tiny bit. When it came to being matched up with someone for the interviews, I won the lottery, girl! It was so much fun e-mailing back and forth, putting a name, a face and a persona with a blog (for some reason, I always think that bloggers looks like their avatar! ), etc. Here is to many more years of blogging together! I just read your interview over at Sandy's and it's so fun to now come over and see her answers. I've only "known" Sandy since this year I think but she's so friendly, it feels like we've known each other forever. Love visiting both of your blogs! Like Sandy, I think that comments are important. At least we know that somebody's read what we've written! All in all, great interview! Love the interview! I found the part about starting your blog and advice particularly interesting, since I'm just trying to start my own book blog right now. Thanks for the tips! I wish I could have read these simultaneously, but again, I am thrilled to see two of my favorite bloggers hooking up. Wonderful interview. I agree about comments: they really can send one "over the moon" as Sandy says, and she truly is the best. Loved the photos of Poland also. Such beauty! Great interview with Sandy. I had no idea that her husband had family ties to the Solidarity movement! I studied that in Poli Sci class back in the day, with a teacher from Poland. Sandy is a riot, isn't she. Love her and the blog...glad she took her sister's advice. That's funny Ana - that's how I used to refer to Sandy's blog too when I'd mention it to my husband - "you know, the one with the cute kitty header!" Both of you did a great job with your interview questions - I think it is hard coming up with ones that will draw out a personal response. And the inclusion of the personal pictures was a nice touch too. Now that I've stopped by I'll be sure to come back again in the future. Happy blogging! Ana, thanks for introducing me to Sandy. Enjoyed the read very much. Will go by to read yours and to check out Sandy's blog. I very pleased to hear we feel the same way about commenting and visiting other bloggers. Loved the interview! Both personal and "professional". Great job! I, and others according to the comments, definitely agree with the comments on a post....the first time I got one I did a little happy dance (in my head, there were people around!) because it's like...WOW! Someone took the time to read my post and comment! Fantastic! Yet another great blog to keep checking back in on...happy reading! Fabulous interview. Thanks for introducing me to Sandy. I have heard about The Devil in the White City. Actually, a patient of mine last year gave me some books (you know..the books you have already read just waiting around for you to share them with others). This book was one for me to choose. I passed it up for The Time Traveler's Wife. Thinking that I need to read The Devil in the White City as it does keep popping up. Library here I come for a hold. Nice interactive interview! I've never heard of Sandy and her blog before (because I haven't made enough time to visit other blogs until this week), but I'm going over there now. And I peeked at the cat photo already--aww! I enjoyed reading both your interviews! Like Sandy, one reason why I like book blogging so much is because I can't really participate in book clubs; this week (BBAW) has been a great way to discover new blogs. I read Pillars of the Earth and the Harry Potter series this summer- great picks. This is a good interview. Nymeth - What a wonderful interview! I feel like I just sat down for a coffee with the two of you. Thank you. Wonderful interview. I enjoyed getting to know a new-to-me book blogger. Sandy is such an interesting person and I totally loved reading this Q&A!! Nymeth, I am all a-buzz over this love, aren't you? Thanks to your following, I had the most comments on my blog today than I ever have since I started blogging. By far! Thank you everyone for almost bringing a tear to my eye. I hope I see you all again real soon! I will pass along all the complements to my cat, Casper. He is a freak, but he is pretty cute when he's sleeping! What a wonderful interview! Great questions and thoughtful answers. I'm off to check out her blog right now! I enjoyed both sides of this interview very much - thanks! What a great interview!! 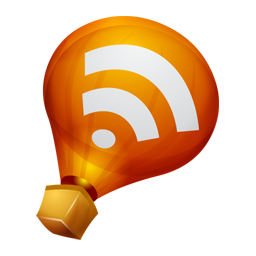 Sandy is a new-to-me blogger, so i'm really looking forward to checking out here blog! When I first saw that pic of Poland, I thought it was Glacier National Park. It looks gorgeous! Great interview Nymeth! I loved reading about Sandy. She is so kind and friendly and has been a great help for me since I am still new to blogging! I just wanted to say I love Sandy! I nominated you for best commenter Sandy because I am always SO impressed with how thoughtful your comments are. You exude such warmth and sensibility through your comments and blogs and I'm so thankful that you decided to start a book blog. ;) We are all better for it! Sandy is wonderful! She's really made me feel welcome to the book blogging community. And she is such an interesting, positive, fun person. 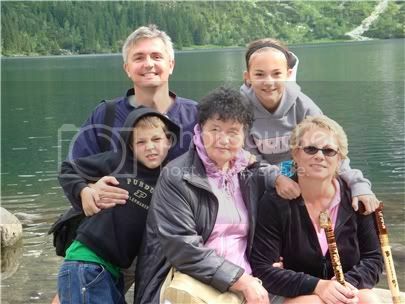 She has an adorable family, I love the picture of her children in Poland & the scenery is incredible. I think she has great tatse in books too & I'm going to pick up Random Acts of Kindness, the book she received from Jackie. Sandy is a great commenter! I love these interviews because we are getting to know bloggers so much better. And what a beautiful photo of Poland! What a great set of interviews! Yes, Sandy's comments are always meaningful and add something to what I've written about. And I know you're a morning blogger, Sandy, because I often wake up to a comment from you, before coffee! Thanks for hosting Sandy here, Nymeth. These blogger interviews are one of my favorite parts of BBAW! Great interviews and nice pictures! Two of my favorite bloggers! Nymeth and Sandy. :-) I'm so glad you were able to interview each other. I'll be forever grateful to Sandy's sister for suggesting she get into book blogging.